Talk about beading ideas that were outside my thoughts! On my own I would never have had the idea of putting my beadwork on a teapot. But when Mobilia Gallery in Cambridge, Massachusetts, invited me to take part in an exhibition of teapots by crafts people in various media, I accepted the challenge. 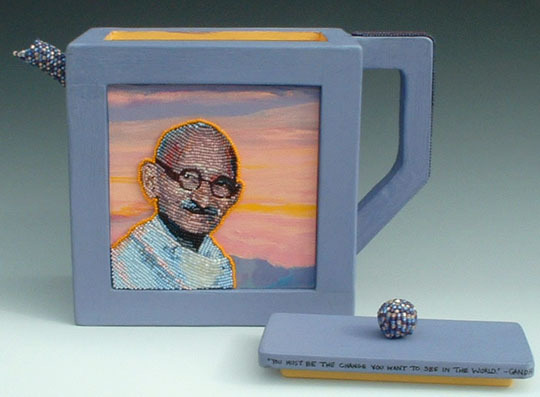 I wanted a teapot with famous people who had advanced the idea of peace in the world. I chose four: Gandhi, Mandela, Martin Luther King and the Dalai Lama. After weeks of drawings and lots of rejected ideas, I decided I wanted to bead on flat surfaces rather than use or create some rounded form with the resulting skewing of perspective. And since time was passing and the exhibition was approaching, I limited myself to two portraits instead of four. I designed the teapot, then created the two portraits. In my original plan, I was going to bead the backgrounds for the portraits, but when I started to do so, I discover I liked the way the portraits stood away from the background, so I trimmed away the beaded and unbeaded background and created new backgrounds by painting acrylic on canvas. I then glued the beaded portraits onto the painted canvas, using acrylic medium as my glue. I made the teapot with wood, covering many of the simple lap joints with the wood strips that would end up framing the portraits. I made the "spout" by drilling a diagonal hole into one narrow side and then glued in a bit of acrylic rod I had around the workshop. Then I covered the rod with clear flexible tubing from the hardware store which I had covered with beadwork. I beaded over a bead to create the knob on the lid, and glued a strip of beadwork on the handle. When the teapot all painted and complete, I added the beaded portraits. It turns out there are quite a lot of collectors of "art" teapots, something I had never known about. This teapot turned out to be my first major work to be sold. Try stretching your own beading ideas. At least part of the time, start your work by deciding how you will finish it, and see where your beading ideas can take you.